Roving Bandit: Are Oxford Admissions Fair? third, the probability that such a student who did apply got admitted - over half for pupils from independent schools, but only about 15% for students from the poorest schools. So there were disparities at each stage of the process. Students from state schools in poor areas were less likely to get very good GCSEs, less likely to apply, and less likely to be accepted. Which sounds pretty damning. I sent this analysis to a friend involved in the admissions process, and he highlighted the important role of the special admissions aptitude test in the process, ignored by the FT and Portes. There is now some evidence backing up his position, from a new working paper by Bhattacharya, Kanaya, Stevens, all at the Economics department in Oxford, and two of whom who have also been involved in admissions themselves (and thus had access to that test data, which is not in the public domain). 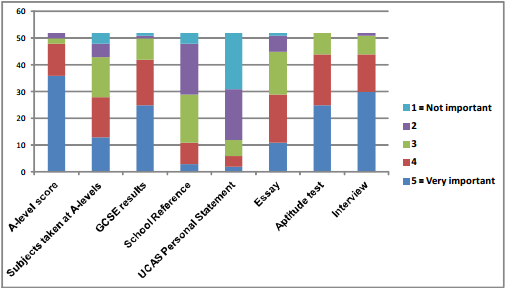 About one-third of all applicants are selected for interview on the basis of UCAS information, aptitude test and essay, and the rest rejected. Selected candidates are then assessed via a face-to-face interview and the interview scores are recorded in the central database. This sub-group of applicants who have been called to interview will constitute our sample of interest. Therefore, we are in eﬀect testing the academic eﬃciency of the second round of the selection process, taking the ﬁrst round as given. Accordingly, from now on, we will refer to those summoned for interview as the applicants. They then find no difference between admission rates for independent and state schools for those invited for interview. 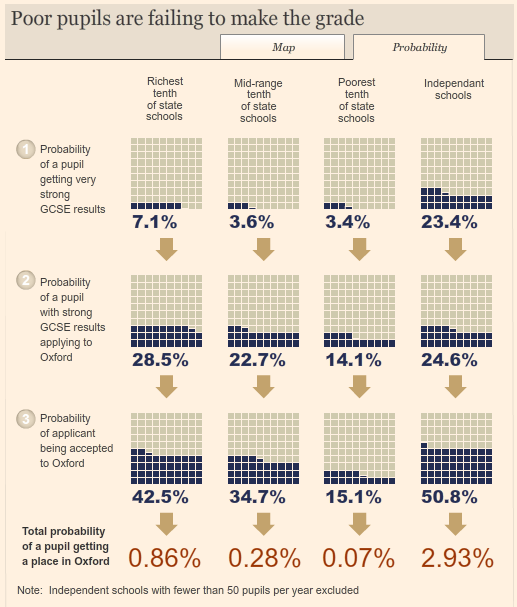 This implies that all of the gap in admission rates between independent and state school students (with equal GCSE scores) found in the FT analysis, is down to poorer performance by state students in the Oxford-set aptitude test. Now, of course the average independent school applicant is undoubtedly better prepared for this aptitude test than the average state school applicant, but this does seem to somewhat let Oxford off the hook. And finally some advice for potential applicants from a survey of admissions tutors (52 responded) contained in the paper; don't spend too much time on your UCAS statement. Do make sure you get good grades and prepare well for your interview. It would be quite easy to test this given that aptitude tests have only recently been introduced for most subjects - certainly five or six years ago the only aptitude tests were for medicine, history and law. A professional writer will ensure that your admission essay is written using international writing style, best essay writing service it is correctly formatted, and it has the necessary content. formatted, and it has the necessary content.